Tangled and True: ice cream. cone. We had a busy slash fun-filled weekend. We celebrated my husband's birthday and Father's Day. Sigh. I'm kind of experiencing a fun-is-over-now-it's-Monday hangover. When I asked my husband to choose a birthday dessert, he chose ice cream cones. So, I picked up some Breyers and waffle cones and we enjoyed the child-like treat all weekend. I felt like a little girl again toting around my ice cream cone in the warm summer evening on our patio. I happily licked my cookies 'n cream and experienced that "not a care in the world" care free-ness. I just stumbled across your blog and I like your style. :) I'm all for ice cream, too. 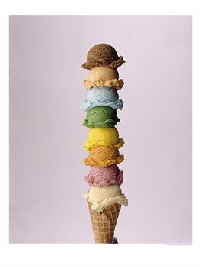 My husband and I are both huge fans of icecream and I would love to serve him icecream cones for his birthday. what a nice idea !!! My favorites: cookies and cream, prailines and cream, irish cream. (it seems like there is a theme going on.) And I'm so with you on the cones, Missy! I can NEVER just do a bowl/cup. I don't get it when others don't choose the waffle. Or even sugar cone.